I only have a few people on my list in this category, but they're among my favorite to shop/make things for, because they always appreciate handmade gifts. I especially love Natalie's bunting stamp and Wakako's masking tape that you can either give as a gift or use to make & embellish gifts. see no.1 for foodies, here. Love it! Very cute post! japanese masking tape has been on my "wish list" for almost a year now! Love all the gifts! Esp the bunting stamps, just so adorable. loved that gold dotted notepad! gorgeous! aw... 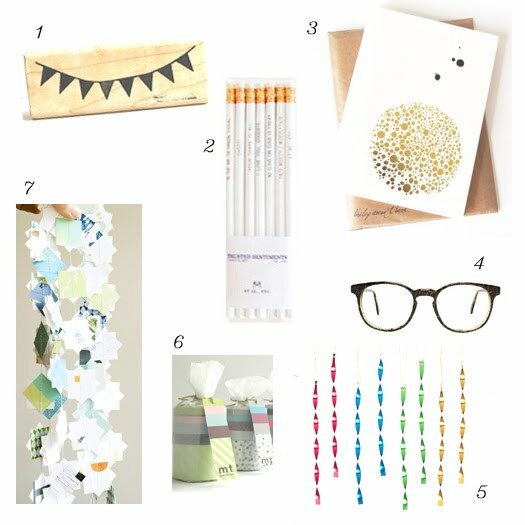 I love how colorful this collection is and I am so thrilled to see our masking tape in the mix! thank you so much for sharing the baum-kuchen love, Alli! Oh I would be in this category and would love to add every one of these items to my wishlist! i have the bunting stamp from olive manna and i love it! it's will be put to good use this season for packaging.